View More In Serving Bowls. At Upper Midland Products are top priorities are having the highest quality products on the market and the number one customer service on the planet. PREMIUM QUALITY UNBREAKABLE PLASTIC - This disposable buffet serving set is made out of the sturdiest high quality food safe plastic.When manufacturing this serving utensil set, we only use the highest quality food safe bpa free plastic. GREAT FOR WEDDINGS AND GRADUATION PARTIES - These are the perfect serving bowls and spoons for any event. Like a bridal shower, rehearsal dinner, weddings, graduation party, birthday party, anniversary dinner, corporate event, catered events, holiday party, gender reveal party,thanksgiving dinner, easter dinner and large family dinners. JUST THE SIZE YOU NEED FOR SERVING FOOD - 9 inches long serving spoons and 64 oz serving bowls. 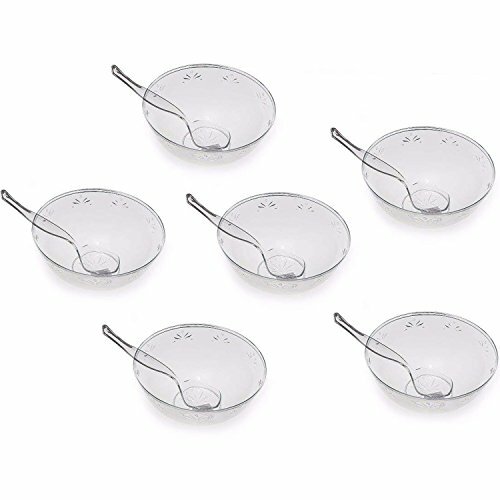 The perfect size for serving salad or any dish. If you have any questions about this product by Upper Midland Products, contact us by completing and submitting the form below. If you are looking for a specif part number, please include it with your message.